New England-wide Program to "Strike Out Inhalant Abuse"
Sea Dogs catcher Matt Spring talks to students at the Loranger Middle School about the dangers of inhalants. Portland, Maine- The Portland Sea Dogs, the Double-A Eastern League Affiliate of the Boston Red Sox, announced today that they are teaming up with the Alliance for Consumer Education to create a New England-wide program to "Strike Out Inhalant Abuse" at six Minor League ballparks in six different states in 2012. The effort seeks to bring awareness to the serious problem of inhalant abuse in a unique program designed to educate parents, school officials, and individuals in the community about the often-overlooked dangers. Participating baseball teams will work with their local SADD (Students Against Destructive Decisions) Chapter to conduct awareness school assemblies and community appearances with mascots and players to educate fans about the dangers of inhalant abuse. The Inhalant Awareness message will be shared all summer through team websites and in-stadium announcements, and the program will culminate in an "Awareness Game" at each stadium. 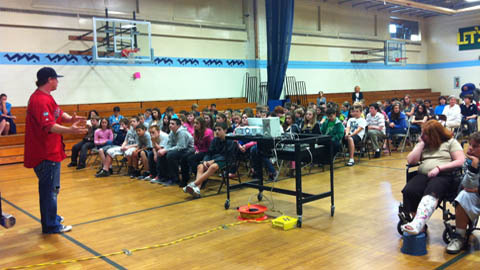 On Friday, June 8, the Sea Dogs began their inhalant abuse program with a visit to Loranger Middle School in Old Orchard Beach. Sea Dogs' catcher Matt Spring, Slugger the Sea Dog, and Courtney Rague the Sea Dogs' Ticket Sales Director met with more than 220 students, teachers, and guidance counselors. Throughout the assembly, participating students were rewarded with tickets to the Sea Dogs' Inhalant Abuse Prevention Night. The Sea Dogs' Inhalant Abuse Prevention Night will take place on Tuesday, August 14th as the Sea Dogs take on the Altoona Curve (Pirates). The Sea Dogs will feature a poster giveaway for the first 1,200 kids that enter the ballpark that evening. A special report by the "Partnership for a Drug-Free America" revealed that 1 in 5 students in the USA between the grades of six and twelve have abused an inhalant at least once in their life. In fact, inhalants are the fourth-most abused substance. "We see a need to share this important message with the families both in the Sea Dogs community, and all throughout New England," stated Sea Dogs' General Manager Geoff Iacuessa. "The Sea Dogs are proud to be a part of this unprecedented six-team effort to positively impact our fans." Visit www.inhalant.org for more information on inhalant abuse prevention and the Alliance for Consumer Education. For more information on the Sea Dogs "Strike Out Inhalant Abuse" program, please contact Courtney Rague at 207-879-9500 or crague@seadogs.com.